During September 2007, a survey preceding development was conducted at et-Taiyiba (Permit No. A-5227; map ref. 24150–275/72250–375), prior to preparing a master plan. 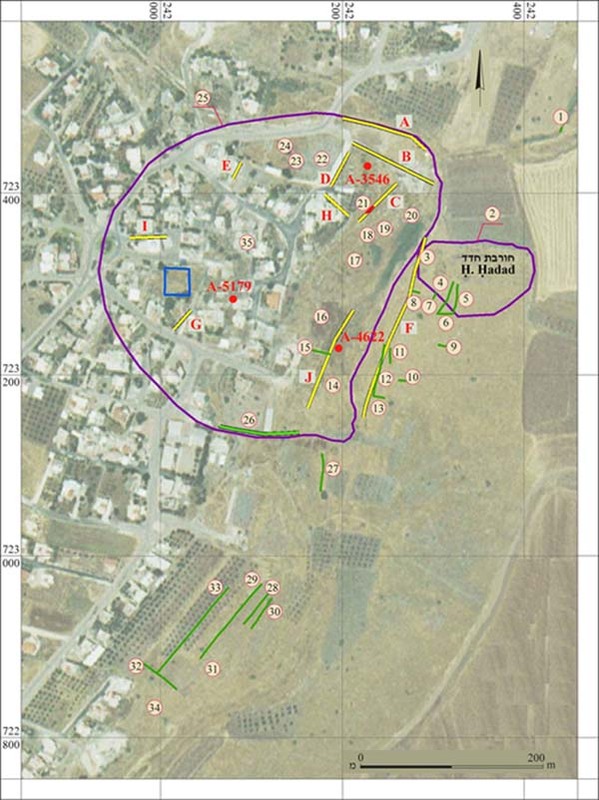 The survey, undertaken on behalf of the Israel Antiquities Authority and underwritten by the Gilboa‘ Regional Council, was directed by Y. Tepper, with the assistance of A. Shapiro (GPS and plans) and B. Hana. The village of et-Taiyiba is situated on the western bank of Nahal Issakhar, c. 1.5 km north of Moshav Moledet and c. 3.5 km south of Qibbuz Gazit. The village was among the sites surveyed by N. Tzori (Nahalat Issachar, Israel Exploration Society, Jerusalem. 1977) and was documented in the Survey of Israel (Z. Gal. 1991. Map of Gazit :47–50). The remains of a fortress dating to the Crusader and Mamluk period are clearly visible in the middle of the village. Two ruins are known within the village precincts, Horbat Haddad, east of Nahal Issakhar and Khirbat et-Taiyiba to its west. The archaeological remains documented in the current survey included walls, remains of agricultural installations, building stones, architectural elements and potsherds dating from the Roman to the Ottoman periods, as well as the boundaries of Horbat Haddad, Khirbat et-Taiyiba and the Crusader fortress. It should be mentioned that several potsherds dating to the Early Bronze Age were found in the vicinity of Horbat Haddad. In addition to the survey information, data from archaeological projects that were conducted in and around the village are summarized below. Boundary wall delimiting cultivation plots; a similar wall to its north. Boundary marker of Horbat Haddad, based on potsherd scatterings in the area. Doorjambs, an olive press weight (No. 3), building stones and potsherds dating to the Byzantine and Ottoman periods were found. 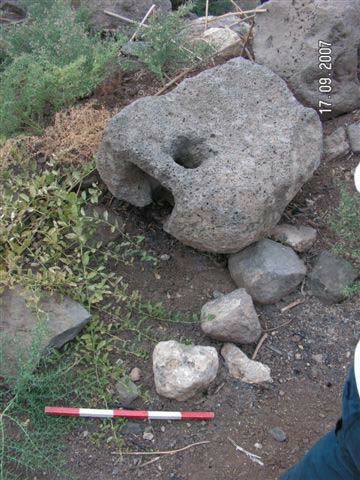 A basalt olive press weight. Boundary wall delimiting cultivation plots. A wall (Fig. 1: J), preserved three courses high, probably remains of an ancient building. A bronze coal pan was found near the wall during antiquities inspection. A wall (width in excess of 1 m) of an ancient building. A large ashlar with a triangular cross-section, probably from the Crusader fortress, is located near the building. Pottery dating to the Crusader period was found in the vicinity of the building. Coin from the Roman period. Remains of an ancient rectangular building (c. 8×10 m), south of the spring. The spring house (c. 4×5 m). Its walls are built of well-dressed basalt ashlars. Modern repairs are clearly visible in the walls and the building’s ceiling is built of cement. Three limestone column drums (diam. 0.5 m) were found nearby. Remains of an ancient rectangular building (c. 8.×10.5 m), north of the spring. Its walls are built of large fieldstones, some are coarsely dressed. A conical cupmark hewn in basalt bedrock (depth 0.1 m, diam. 0.15 m). An industrial mosaic floor of limestone tesserae (discovered during an antiquities inspection, see below, C); pottery dating to the Roman, Crusader, Mamluk and Ottoman periods. 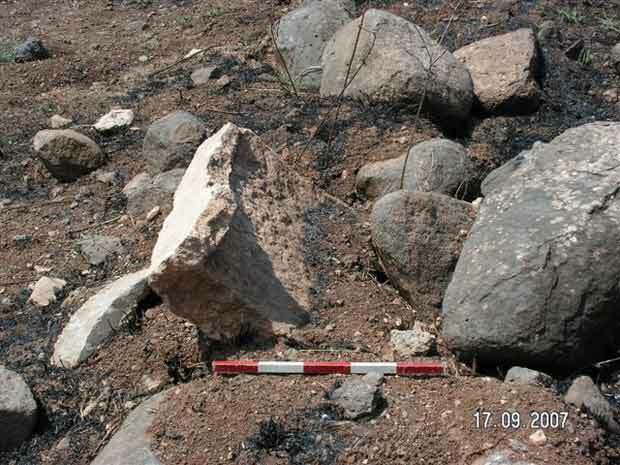 A fragment of an Ionic capital and other basalt architectural elements were found nearby. A built rectangular tomb in an ancient cemetery; a cross is engraved on a stone in the bottom course. A built rectangular tomb in an ancient cemetery; an architectural element is incorporated in the upper course. Six built tombs in an ancient cemetery, arranged side by side and oriented north–south. Their upper part is vault shaped and their lower part is a wide, built foundation that serves as a broad base. Boundary markers of et-Taiyiba, based on the survey finds. A wall built of large stones (max. width 2 m). A boundary wall delimiting cultivation plots. Boundary walls delimiting cultivation plots. Potsherds from the Roman and Byzantine periods. Basalt slabs, probably for covering tombs. Potsherds dating to the Roman and Byzantine periods and several fragments from the Early Bronze Age. Fragment of a limestone sarcophagus; a fragment of an olive press weight was found nearby. Barrel vault of an ancient building in the cellar of a modern building. Remains of traditional construction and the Crusader fortress in the center of the village are still impressive and visible. The survey found archaeological evidence of human activity dating from the Roman until the Ottoman periods at the site. A few earlier potsherds that probably date to the Early Bronze Age were found in the agricultural area southeast of the village. Architectural elements and numerous ashlars reflect the nature of the buildings that stood at the site. The survey documented areas of traditional agriculture in the vicinity of the village and evidence of agricultural installations (an olive press weight, Fig. 2) were found. Potsherd concentrations, building stones and architectural elements were noted on the northern and eastern slopes of Khirbat et-Taiyiba and in the vicinity of Horbat Haddad, indicating the intensity of the settlement. Remains of crosses on ashlars are indicative of a Christian population, possibly from the Byzantine period, but more likely from the Crusader period. An old cemetery that was probably established sometime in the Ottoman period is located in the north of the village. Sarcophagi (Fig. 3) that dated to the Roman and Byzantine periods were found on the slope southeast of et-Taiyiba. A—Antiquities in ten locations; numerous walls and floors with ceramic finds, particularly from the Late Byzantine and Early Islamic periods. B—A number of walls and potsherds from the Byzantine, Early Islamic and Mamluk periods. C—Floors, walls, ash layers and industrial mosaic floors (Fig. 1: 21). D—Walls and floors dating to the Byzantine period. E—A wall and potsherds from the Roman and Byzantine periods, located on the northwestern slope. F—Walls, terraces and potsherds from the Byzantine to the Mamluk periods on the eastern bank of Nahal Issakhar. G—Walls from the Byzantine and Crusader periods southwest of the Crusader fortress. H—Walls from the Byzantine and Crusader periods. I—Walls built of basalt stones and potsherds from the Mamluk and Ottoman periods west of the fortress. J—Walls and potsherds from the Roman to the Ottoman periods along the channel at the foot of the site. A bronze coal pan is a special find. The intensity of the antiquities is evident from the inspections and probe trenches, particularly on the northern slope, but also in other regions: near the fortress, along Nahal Issakhar, as well as next to Horbat Haddad. It seems that the site was first inhabited in the Roman period and the settlement continued throughout the Byzantine, Early Islamic, Crusader and Mamluk periods. Three archaeological excavations were conducted in et-Taiyiba village and near Horbat Haddad, in the wake of the aforementioned antiquities inspections (Fig. 1: Permit Nos. A-3546, A-4622, A-5179). The excavation along the northern slope of the village (HA-ESI 120) exposed numerous architectural remains in three strata that dated to the Byzantine (fourth–sixth centuries CE), Crusader (eleventh–twelfth centuries CE) and Mamluk (thirteenth–fourteenth centuries CE) periods. The finds from this excavation included fragments of pottery and glass vessels, metallic objects and several coins that dated to the Late Roman and Mamluk periods. A round industrial installation was excavated along Nahal Issakhar and the finds it contained were date to the latter period. The excavation conducted along Nahal Issakhar at the foot of Khirbat et-Taiyiba (Permit No. A-4622) revealed two pools or reservoirs (4.8×5.2 m, depth 1.2–1.5 m) that were supplied with water conveyed by a built aqueduct, which was partially exposed coming to the pools from the direction of the spring. The pools, coated with hydraulic plaster, dated to the Byzantine period. Three strata from the Crusader, Mamluk and Ottoman periods were exposed in the excavation next to the Crusader fortress (HA-ESI 123); no remains that predated the Crusader period were discovered. Remains of buildings and installations that ranged in date from the Roman to the Ottoman periods were exposed in the excavations. No remains that predated the Crusader period were found near the fortress, whereas architectural remains of a settlement that dated to the Byzantine period and continued uninterrupted to the present day were found on the northern slope and along Nahal Issakhar. Two ruins are known in the village of et-Taiyiba. Based on the survey finds, it seems that the Byzantine-period settlement expanded eastward to Nahal Issakhar, toward the area of Horbat Haddad. The center of the settlement was situated west of the stream in later periods that were documented, particularly the Crusader and Mamluk periods. Owing to the limitations of the survey in the modern village, the center of the modern village could not be properly documented. Nevertheless, the combined data from the survey, antiquities inspections and excavations make it possible to mark the antiquities concentrations within the boundaries of the modern village (Fig. 4). I—The region of the Crusader fortress and its visible remains. III—The old cemetery to the north. IV—The northern and eastern slope on the bank of Nahal Issakhar, open areas that have not yet been covered with modern construction. V—On the southeastern slope outside the built-up area of the village, in terraced farmland, probably tombs. VI—An area around the fortress ancient buildings dating to the Crusader and Mamluk periods are standing. Archaeological finds from the Bronze Age(? ), Hellenistic, Roman, Byzantine, Early Islamic, Crusader, Mamluk and Ottoman periods were documented in the surveys. The bronze coal pan that was discovered during an antiquities inspection is presumably indicative of a Jewish population at the site. The documented crosses and architectural elements from public buildings are indicative of the importance of the settlement at the site and contribute to the understanding of the history of man’s settlement in Ramat Issakhar. 2. An olive press weight at the edge of the village, looking south. 3. Fragment of a sarcophagus on the eastern slope of the village, looking west. 4. The antiquities sites in et-Taiyiba village (aerial photograph of the village from the 1990s).